London, July 18, 2013 — HTC, a global leader in mobile innovation and design, today announced the HTC One mini, a compact version of the award winning HTC One, which has redefined the smartphone experience with revolutionary technologies including HTC BlinkFeed™, HTC Zoe™ and HTC BoomSound™. Available in 181 countries and across more than 583 networks worldwide, the HTC One has proven to be an unprecedented success across the globe, receiving multiple industry accolades since launch and increasing the company’s brand awareness with young consumers to an all-time high of 87%. The number of consumers intending to own an HTC in the next six months has also doubled as a result with the HTC One being recommended by 94% of owners. Answering the call of consumers who want the best in mobile technology in a body that slips easily into a pocket, the HTC One mini heralds an exciting period for the company, as it builds on its platform of innovation leader. Distilling the iconic design of the HTC One, this new addition to the family combines a 4.3” display and powerful dual-core 1.4 GHz processor. It also runs the latest version of Android with HTC Sense®, bringing HTC’s flagship mobile experience to style-seekers who demand premium looks and performance. 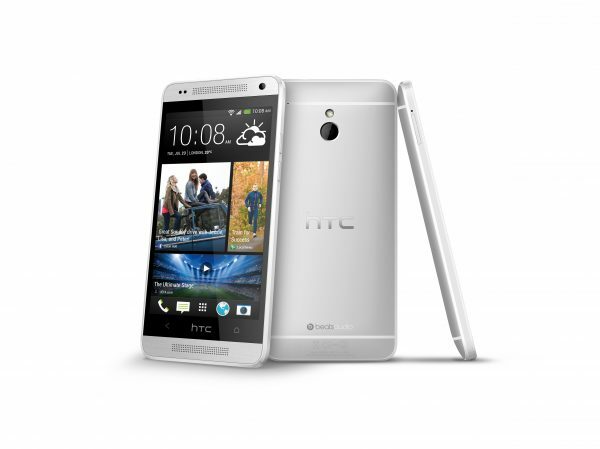 Sporting a sharp and vivid 4.3” High Definition 720p screen, the HTC One mini boasts HTC’s unrivalled design credentials. Available in Glacial Silver and Stealth Black, its striking aluminium unibody, slim profile and tapered edges both look incredible and feel great in the hand. The HTC One revolutionised the smartphone audio experience with HTC BoomSound’s dual frontal stereo speakers. Powered by dedicated amplifiers to deliver less distortion and finer detail, the HTC One mini offers the same huge sound, delivering the raw power that will put you and your friends at the heart of the action, whether listening to music, watching videos or playing games. Beats Audio™ integration takes immersive audio to the next level, guaranteeing the best listening experience available on a mobile phone. The HTC One mini puts your favourite content at the centre of your mobile world. Transforming the home screen into a single live stream of relevant information, HTC BlinkFeed delivers social updates, news updates and photos directly to the place you need them most. Aggregating the freshest content, with more than 10,000 feeds served up daily from the most relevant and interesting sources, all the information you need is available at a glance, without the need to jump between multiple applications and websites. Never miss a moment with HTC’s revolutionary camera experience powered by the stunning UltraPixel Camera and featuring HTC Zoe. Capturing 300 per cent more light than traditional smartphone camera sensors, HTC’s UltraPixel camera captures photos in incredible detail and enhanced dynamic range, even in low light. HTC Zoe also brings special moments to life in three-second videos, enabling a range of advanced editing capabilities and creative flexibility. With the ability to take awe-inspiring images and amazing self-portraits on the 1.6MP front-facing camera, you won’t want to keep them to yourself. Watch your photos come to life in a living, breathing gallery and share special events with visually stunning 30-second shows, created automatically by Video Highlights – no professional editing software or skill required. Simply select your own soundtrack from one of the pre-loaded themes or from your personal music library, before sharing your videos online for everyone to enjoy. The HTC One mini will be available in select markets from August and rolled out globally from September.